Fairy Tail Gets It's Own Monthly Magazine.... Again! Fairy Tail Gets It’s Own Monthly Magazine…. Again! Kondansha announced on their website that Hiro Mashima will, once again, be receiving a new monthly magazine dedicated to his Fairy Tail manga franchise. This comes off the heels of Kondansha cancelling the Monthly Fairy Tail Magazine just last month. The new magazine launches digitally on September 1, 2015 and will launch a printed version on September 17, 2015. The new magazine will be called Monthly Fairy Tail Collection. The original magazine launched in July 2014 and ran the Fairy Tail Zero and Tale of Fairy Tail: Ice Trail spinoff mangas. The magazine ended after 13 issues, wrapping up in July of this year with both spinoff series concluding in the final issue. The new magazine; however, will not just come with manga. Each issue will contain a DVD with 4 episodes from the anime along with a video from Lucy’s voice actress Aya Hirano. Each issue will also contain three pieces of merchandise that were designed by Hiro Mashima himself. The merchandise for the first issue will contain a rubber stamp featuring Natsu and Happy, an acrylic key chain of Lucy, and a tin badge with Gray. 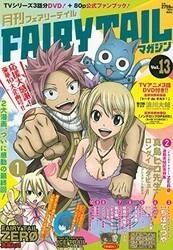 Currently, the Fairy Tail manga series is running, along with a spinoff called Fairy Tail: Blue Mistral which centers around Wendy, and a brand new series that just started called Fairy Tail: Sabertooth, which follows the guild that was prominent during the Grand Magic Games story arc of the original manga. Fairy Tail also has an anime running with over 240 episodes along with several OVAs, and movies.